With young adult book sales rising, and bestselling authors exploding onto the scene, aspiring YA writers are more numerous than ever. Are you interested in writing a young adult novel, but aren’t sure how it fits the style that appeals to young readers? 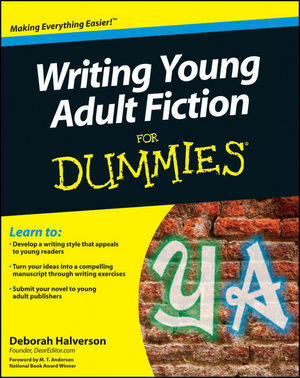 WRITING YOUNG ADULT FICTION FOR DUMMIES gives you tricks of the trade and proven tips on all the steps of writing a YA novel, from developing an idea to publication. With the help of this step-by-step guide, you’ll have all the skills to write an inspiring and marketable young adult novel. *Get the FREE official, printable Writing Young Adult Fiction For Dummies “Cheat Sheet” for quick tips into creating a youthful narrative voice, creating convincing teen dialogue, and evaluating character and plot.